Established swimming pool management company expanding into an online presence, offering quick information for customers and potential employees. 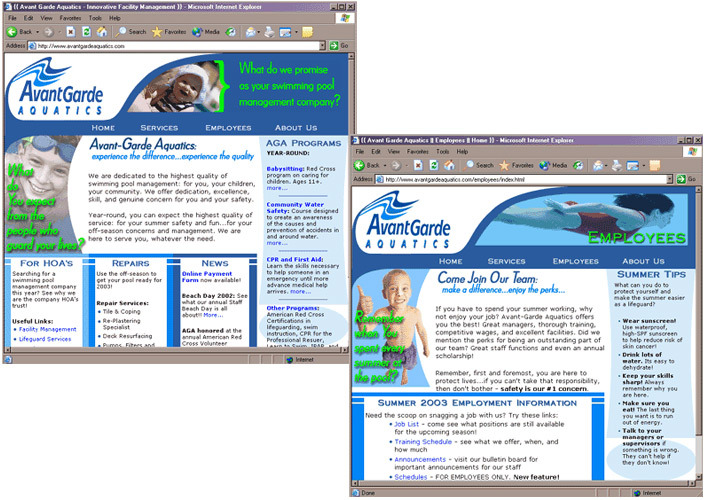 Avant-Garde Aquatics was a swimming pool management company in Houston, Texas. For over ten years, they built a reputation for being innovative, accountable, and responsive in an industry where the status quo is anything but progressive. Managing over 70 community swimming pool facilities, this company employed hundreds of lifeguards and taught more than 3,000 children to swim every year through the Red Cross Learn-to-Swim program. Knowing the company and its reputation, I looked to see if they had a website. I was pleasantly surprised to find that they did, but saddened to see that it didn’t really reflect the level of professionalism that their company was so careful to cultivate. I contacted the owner, Michael Bratton, and approached him with some ideas I had to give his web presence a true reflection of his company’s image. Mike was excited by the possiblities, and we set to work identifying his needs. The website needed to appeal to 3 different audiences: potential clients, potential employees, and current clients’ community members looking for more information on the programs being offered at their local pool. Mike wanted to give patrons the ability to pay for their swim lessons online, and potentially expand the functionality of the site to include online swim lesson registration and employee scheduling. What we needed was a professional, engaging site with a strong architecture that allowed for later site expansion. Since the company already had a great logo and a unique, fun niche, I wanted to create a professional but inviting website using the blues and water images they already associated with their company. I wanted the website to reflect their dedication to the communities they served and encourage people to come back to the online interface for information on a regular basis. The resulting website was colorful, easy to navigate, and appealed to all three target audiences. I added a Flash banner at the top of the home page that offered a rotating overview of their services. We implemented a simple and inexpensive online payment system that can later be replaced with a more integrated solution. Avant-Garde Aquatics was thrilled with their new virtual presence. New employees found them online, parents paid for swim lessons from work, and homeowner committees learned more about them at their leisure. At trade show following the website launch, the company was even hailed by peers as “pushing the envelope” and “moving into the future” with their website. Avant-Garde Aquatics was once again seen as the innovator in their industry!